June 18, 2018 5:00 P.M.
Mayor Brian Linin called the meeting to order with Vice-Mayor Jay Dee Brumbaugh, Commissioner Annette Fairbanks and Commissioner Jacque Schields responding to roll call. Commissioner John Garcia was reported absent. Also present were Rich Simon – Director of Public Works, Dustin Bedore – Director of Electric Utilities, Joni Showalter-Police Chief, Suzanne McClure – Economic Development Director, Alex Weis – Code Enforcement, Brian James – Fire Chief, Mary Volk – City Clerk, Jake Kling – City Attorney and Andrew Finzen – City Manager. ON A MOTION by Commissioner Fairbanks to approve Consent Agenda seconded by Vice-Mayor Brumbaugh. MOTION carried on a VOTE of 4-0. Resolution 1530: GAAP Waiver 2018 – Andrew stated, this is annual resolution to exempt City from GAAP, allowing operations on cash basis. ON A MOTION by Vice-Mayor Brumbaugh to approve Resolution 1530: GAAP Waiver 2018 seconded by Commissioner Fairbanks. MOTION carried on a VOTE of 4-0. Resolution 1531: Unfit Structure 418 E. 17th – Andrew stated, unfit structures at 1619 Kansas and 1409 College were demolished at property owner’s expense so we are able to seek additional properties from our list. At 418 E. 17th, the roof to building is open to weather. This is commercial property so if it is demolished, we have to do an asbestos assessment, which I would expect to cost less than $1,600. Resolution sets hearing date of August 6th for property owned by Plains Properties. The inside pictures you see are taken through the windows from outside. ON A MOTION by Commissioner Fairbanks to approve Resolution 1531: Unfit Structure 418 E. 17th seconded by Commissioner Schields. MOTION carried on a VOTE of 4-0. Resolution 1532: Unfit Structure 615 W. 13th – Andrew stated, resolution is for residential property at 615 W 13th. Windows are broken out and property shows neglect and has a lot of blight. A citizen attending last meeting complained about this property. Resolution sets hearing for August 6th. Owner passed away five years ago. J.J. Howard citizen asked, how long have taxes not been paid and why was this property not on tax sale? Andrew stated, the County has control of tax sale. Commissioner Fairbanks stated, the information shows taxes for 2012-2017 are delinquent, but the County controls when property goes up for tax sale. Mayor Linin stated, you will have to ask the County as that is out of our control. ON A MOTION by Commissioner Fairbanks to approve Resolution 1532: Unfit Structure 615 W. 13th seconded Vice-Mayor Brumbaugh. MOTION carried on a VOTE of 4-0. Project Agreement: Historic Brick Street Rehabilitation 91TE-0454-01 – Andrew stated, this is a standard agreement with the State of Kansas for the 9th – 10th Main Street Brick Project. It has been reviewed by the City Attorney without issue. They anticipate project commencing in spring 2019. ON A MOTION by Vice-Mayor Brumbaugh to approve Project Agreement: Historic Brick Street Rehabilitation 91TE-0454-01 seconded by Commissioner Fairbanks. MOTION carried on a VOTE of 4-0. Early Retirement of 2013 Series GO Bonds – Andrew stated, we have the ability to make final payment on 2013 bond series for water system improvements, rather than carry bonds to 2020. We will have interest savings of $6,300, but get issue off books. ON A MOTION by Vice-Mayor Brumbaugh to authorize early retirement of 2013 Series GO Bonds seconded by Commissioner Schields. Mayor Linin asked, with rate we get on bonds, when would it have paid off if we choose not to pay-off early? Andrew stated, September 2020. MOTION carried on a VOTE of 4-0. Establishing a Dog Park – Andrew stated, item was discussed May 7th when discussed grant award from Dane G. Hansen. The City received $250,000 for a series of projects. One project the committee feels comfortable proceeding with is Dog Park because it will be minimal expenses. We are seeking approval from Commission to use public land located just southeast of the VanGogh and east of the Welcome Center that is owned by the City for this purpose. We feel this location will not detract from VanGogh painting. With approval the Commission is committing to upkeep of park, which is minimal. Animal shelter wants to do a sidewalk with old bricks from Main Street and there will be some pine trees planted. Commissioner Fairbanks stated, the committee decided to invest in coated black chain link fence to match existing rod iron fence. ON A MOTION by Vice-Mayor Brumbaugh to approve location for the dog park seconded by Commissioner Fairbanks. MOTION carried on a VOTE of 4-0. July Meeting Schedule – Andrew stated, trying to coordinate schedules with the July 2nd meeting, which tends to be hit and miss with the holiday. I would like to know whether to proceed with the meeting or move to 9th. Mayor Linin stated, leave it as scheduled as there is not a big difference with harvest. Consensus of Commission is to leave meeting as scheduled. Andrew stated, budget meetings are still scheduled for June 25th and 26th at 5:00 p.m.
Transportation Alternatives Program – Andrew stated, this is a KDOT program, the City has used to fund brick streets projects. The program is an 80/20 grant. The brick streets are under historic, but there are other grant options available for pedestrian/bicycle trails, streetscapes and safe routes to school. The grant cycle is open now but we do not have enough money in Grant Improvement Reserve Fund to file another application. I just wanted to start discussion to see if Commission would like to pursue other options. Mayor Linin asked, when the 9th – 10th Street grant is complete, what parts of Main Street are left? Andrew stated, 8th – 9th will need done. We will have completed 9th – 13th, as well as intersections to 15th. Mayor Linin asked, what is maximum award in program? Adam Schart Wilson & Company stated, there is no maximum award, just have to be strategic in application process as they only have so much money and want to award as many as can. Mayor Linin stated, this funding has been good for brick streets but would also be good for streetscapes. Rich stated, we need to complete 8th – 9th if possible. All the blocks on south end are also showing wear and tear. Andrew stated, the City match is usually more than the 20% because we do additional infrastructure work while street is torn out. The unfortunate thing with the streets is the project has a life expectancy, so if we start doing streetscaping, we will have to pay more since original street funding was with grant money. Mayor Linin asked, can we include it with next application or would that look funny? Andrew stated, at this point cannot add into the current project. There is a concern with future projects if we include with application, that we will have one block of Main Street different than rest. Fire Training Facility: Brian James, Fire Chief – Brian stated, we checked with weather service, facility will be permitted on property to east since it is below 10’ radar requirement. We looked at using Dane Hansen grant where Hays received half the funding for their facility. If we apply for grant with same understanding, we would be looking at City paying remaining or using a USDA grant for $18,000, then finance remaining with a USDA loan; unfortunately it is a forty year loan. If we receive a grant from Dane Hansen for half the cost, the City’s payment will be from $4,000 to $8,000 per year. Brian stated, the cost is $52,000 higher than original estimate with asphalt chips and Lohr Electric doing wiring. There is power out at site. We received letters of support from neighboring municipalities as the facility would help region with training. Otherwise, we would have to bring out KU representatives and use private property. If we get a Hansen grant, we cannot charge for use of facility but can charge for certified instructors we have on hand to offset some costs. This would be a multi-purpose facility. Matt Breininger Fireman stated, the facility would reduce training expenses to send firefighters to offsite training. We are asking Commission for recommendation on use of loan. Mayor Linin asked, can we use money in City reserves allocated for another project, then pay ourselves back? Would other communities contribute funds to help get more funding? Matt stated, that is our thinking since Hansen Foundation promotes regional projects. Vice-Mayor Brumbaugh asked, are you looking for other funding options than just Hansen Foundation? Brian stated, yes but they are limited with this type of facility. We have applied with FEMA for a number of years but turned down as department is too small. Vice-Mayor Brumbaugh stated, Hansen Foundation is pushing for more options, so do not rely solely on Dane Hansen grant. Can we allocate all the training budget toward the payment? Brian stated, there will be some specialized training for certification we will have to attend so we can reduce budget for local hands on training if we have facility. Vice-Mayor Brumbaugh stated, I am not aware that Hansen Foundation does not allow you to charge for use of facility to recoup costs. They have not been against that with hospital equipment so I would include it in your application. Mayor Linin stated, I am not opposed to option, but would like the option to use our money and pay the project back. Andrew stated, I am concerned with reserves and ability to do so, but will discuss during budget. Trail Master Plan – Andrew stated, the committee is looking at leveraging money by pursuing a Kansas Department of Wildlife and Parks Grant, using Dane Hansen money for City’s 20% match so there is no tax payer expense. Part of application requires City to adopt a Trail Master Plan. I would like the Commission to review plan to discuss at future meeting. Main part of the plan is identifying trail alignment and what trails connect. I would like Commission and citizen input on plan. Deadline for grant application is August 1st. One point to remember with a master plan is that it continually needs to be updated so we can go back and amend plan with ease. I identified general areas such as Highway 24, Highway 27 and Golf Course where there is not a lot of trail and tried to look at an overview of Sherman County where trails may develop. Downtown Master Plan – Andrew stated, this ties to our earlier discussion. The Commission discussed a Downtown Master Plan as a priority and I would like to get discussion started to know scope of what Commission would like included. Typically a plan has a very broad scope looking at types of business and aesthetics would like? This is a service you typically hire a consulting firm to complete. 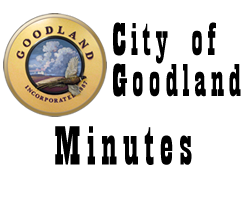 I would like to send examples of plans to Commission to determine direction for Goodland’s plan. You need to determine downtown priorities you would like to see. Commissioner Fairbanks stated, we set this as a priority but unsure which direction to go. Mayor Linin stated, I would like a comprehensive plan rather than only aesthetics because that is only one piece of the puzzle. Andrew stated, you can make a beautiful downtown but have to look at needs to draw people downtown. Mayor Linin stated, we may include Exit 17 in plan as that is first impression of Goodland to many people. Commissioner Fairbanks stated, we need to decide what we want our downtown to be and how we will fill the buildings. We need to identify what we foresee before we put a lot of money into a street and have nothing to offer. We have several businesses where people want to retire and no one wants to take over and revitalize business. Andrew stated, if you want to pursue, the next step is to outline a timeline to develop plan. Vice-Mayor Brumbaugh stated, we want it to look nice but we need to have people willing to visit and purchase from the business on Main Street so it will survive. City Managers Report- 1. We had the pre-construction meeting for the street project; it is set to begin first week of July. Plan is to begin with road in Industrial Park and the extension. The road will never be closed down, then they will move to Cherry Street. From there they are developing a game plan. 2. The Special Olympics are celebrating 50th anniversary and are asking for City involvement celebration. They are asking communities across the world to light monuments up red. We are lighting up the VanGogh on July 20th. Goodland and Wichita are only communities asked to participate in Kansas. I am trying to schedule joint meeting with County Commission mid to late July if you can look at your calendars. 4. The Cemetery Board met, with issues leading up to Memorial Day we are putting gates back up from sundown to sunrise. There are posted hours but during summer we allow longer hours. They are also discussing the columbarium again and will have a presentation at budget. 5. The Museum Board is working on a Strategic Plan. They will be meeting to review recent survey results. 6. I am working with County Appraiser on GIS and sharing of parcel data. 7. We are reviewing security concerns of a full room like last Commission meeting. We need to look at ways can facilitate meetings. If we start moving meetings we have a chance of running into a violation of open meetings act. 8. We are spraying mosquitos weather permitting, need wind to be less than 20 mph. Rich stated, we are trying to hit fairgrounds by July 4th. Economic Development Director – Suzanne gave a brief update on economic development events. The Governor was in Goodland for designation of opportunity zone. I have been in contact with Assistant to the Governor regarding signs on I-70. The Butterfly Cafe is reopening July 2nd and Gary Smith is rebuilding at Vet office. I have been working with Network Kansas, Jessica is going to Manhattan to attend YEC Summit. The Welcome Center is close, we will show pictures when complete. We plan to move out there this week even though we are still working on signage. Jade Artzer is an intern funded by Network Kansas and Kinsey Volk is an intern funded through Nextech. We have had several calls from people wanting to relocate to Goodland and having a time finding housing, which remains to be a challenge. I attended County Commission meeting with Randy Rhabe because the county had not paid dues to Northwest Kansas Planning and Development Commission. These are dues they have paid for a number of years and the City and Sherman County have benefited from many projects through program. Andrew stated, I urge the Commission to contact County Commission to return funding. They have done a ton of good in Goodland and have brought millions of dollars into our community. They have ceased funding of Economic Development, this was their one remaining contribution of Economic Development. I have a concern that this is a loyal organization and do not think it was fair the way it was done. They did not pay dues and did not tell him they were not paying them. They suggested the City pay the dues. This is what hurts our community and prevents it from growing. This is an organization we definitely want to keep. I think there is a misunderstanding that they think we can just raise electric rates to fund projects. We need to bridge this gap. Suzanne stated, they indicated the City needs to pay the bill. I Called Randy’s office today, the majority of memberships are county memberships. Commissioner Fairbanks asked on Welcome Center, how are we letting people outside our area know we have it? Suzanne stated, I am working with Leon on sign options and Kinsey is working on launching a social media campaign for the center. City Attorney – Jake gave the Commission a refresher of Kansas Open Meetings Act (KOMA) and triggers when conduct a meeting. In addition, Jake stated, giving meeting notice and setting agendas are not required by statute, but if the documents are used they must be accurate. Jake reminded the Commission of information that should be in the motion for an executive session and that no formal action can take place in session. For executive session, the motion must justify closure, state subject discussed and when meeting will be back in session. If the Commission does not comply and a complaint is filed, you must comply with request for an investigation. This is a civil action and if found to willfully violate, fine is $500 per violation. All subordinate groups of City are subject to KOMA. Suzanne asked, what groups in town are required to follow act? Jake stated, any elected or governmental organization in town and their subordinate groups. Vice-Mayor Brumbaugh – 1. I have been contacted by a business owner in favor of participating in grey hound discussions. There is interest in getting something done on this issue. Commissioner Fairbanks – 1. Are we at a standstill with property at 1008 Main? Andrew stated, the property was sold to an individual that was surprised the listing on eBay was not accurate. He decided not to file deed and we have lien on property for roof. Property is site safe and City can invest to bring structure to code which would be costly, so addressing other unfit properties. Yes, this is at a standstill. Mayor Linin asked, did money change hands? Andrew stated, yes but he is challenging on eBay and if needed plans to get an attorney. 2. Is there a plan for curb that has broken down at 10th and Broadway? Rich stated, that curb is part of the upcoming street project. Commissioner Schields – 1. I had two citizens following last meeting that stated they no longer like to go out to businesses on exit with Grey Hound Bus, so it is an issue. Vice-Mayor Brumbaugh stated, the issue with business owner that contacted me is safety of staff. Under authority of K.S.A. 75-4319 (b)(2) for consultation with an attorney for the body or agency which would be deemed privileged in the attorney-client relationship – Vice-Mayor Brumbaugh made a motion at 6:47 p.m. to recess into executive session under authority of S.A.75-4319 (b)(2) to discuss code enforcement issues on 10th Street not to exceed twenty minutes. I request the Commission, City Attorney, Brian, Alex and City Manager be present. Commissioner Fairbanks seconded the motion. MOTION carried by a VOTE of 4-0. Meeting resumed at 7:07 p.m.
ADJOURNMENT WAS HAD ON A MOTION Vice-Mayor Brumbaugh seconded by Commissioner Schields. Motion carried by unanimous VOTE, meeting adjourned at 7:07 p.m. Budget workshops are scheduled for June 25th and 26th at 5:00 p.m. and next regular meeting is scheduled for July 2nd.